Why, yes! I do have more Barbie fairy tale remakes! Thanks for asking. I know you enjoyed reading about the last two, almost as much as I enjoyed playing them and writing them up for MobyGames. I’m sad to report, however, that Barbie as Sleeping Beauty simply is not as engrossing as the previous 2 fairy tale adaptations. And how could it be? The protagonist is supposed to sleep through much of the tale. So, all in all, not terribly interesting… save for the boss battle against a fairy! More on that later. 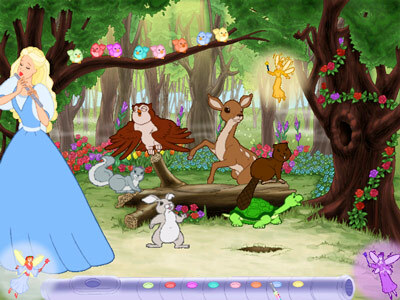 The developers had to reach a bit for ways to turn this into a game; several of the activities just take the form of “click here, here, and here on the screen; okay, next activity.” This minigame was decent, though: Barbie has to wake up her forest friends by delivering a unique wake up call to each using her magic flute. The birds above show the way. Of course, it’s not Barbie, it’s Barbie in her dramatic turn as Princess Rose. As a brief refresher, the princess is born and a bunch of nice fairies come to bless the child with gifts. But there is one malicious fairy who — same as in the Rapunzel tale — felt that she was snubbed (dang, fragile egos and dark magic do not mix) and curses the child such that if she punctures her skin on a sewing spindle prior to her 16th birthday, she will snooze for 100 subsequent years. Another fairy is able to soften the curse somewhat by adding the stipulation that a prince can wake her with a kiss. 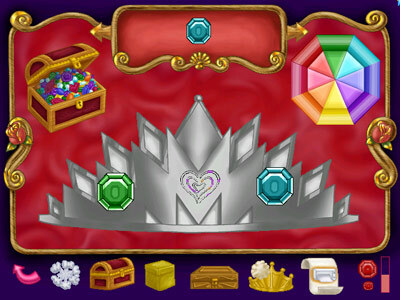 Yes, there are create-a-dress and create-a-crown activities as can be expected from this type of game. Anyway, one thing leads to another and the evil fairy shows up and whips out a sewing spindle and Princess Rose can’t wait to prick her finger on the needle. 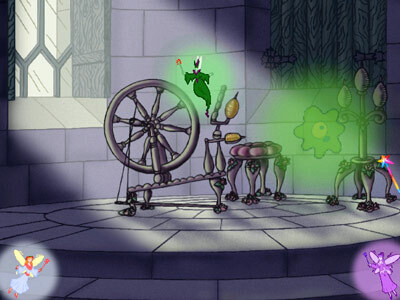 The fairies put the rest of the castle to sleep while they work out a solution (was that part of the original tale?). So they find a nearby prince and encourage him to lend his lips to the situation. The bad fairy, however, foresaw such a threat and summons thorny bushes to surround the castle. 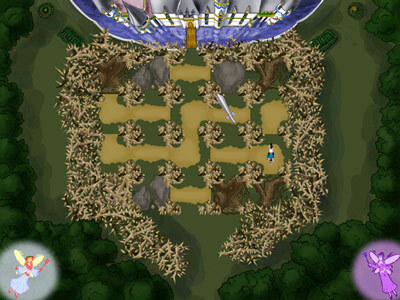 The prince must first slash through the thorns and then rotate pieces of the path to allow passage to the castle gate, in the game’s other halfway novel minigame. I’m hard pressed to think of another game where a fairy is the lead villain and must be dispatched in a first person battle. Actually, this battle just involves deflecting her evil magic with your wand using a mouse until you can get close enough to… turn her into a butterfly and reclaim your magic flute. Don’t worry– more Barbie games to come! Well… I have been thinking of buying a pink convertible and moving to Malibu. But I’m sure that’s unrelated. This game is not responding. Kindly ensure that you install this game to every computer of the world instead of selling expensive CD’s.